I can't even believe that we are just about 2 months into 2016 already. Yikes! Time flies! I still have so many things I want to experience before winter is over, including snowshoeing to Nambe Lake, so I hope Santa Fe sees a few more inches of snow before spring arrives officially, but for now I am really enjoying the sunshine and unseasonably warm afternoons! Welcome to Part 2 of my culinary journey for 2016: exploring ethnic flavors and recipes that represent the unique qualities of cultures around the world. Last month I brought you Thai Green Chicken Curry, and now we move onto West Africa and this delicious, bright, and flavorful stew. There are many varieties of West African Peanut Stew (also called Maafe) depending on whether you're in Mali, Senegal, or Gambia, and it can be made with various types of meat. Sweet potatoes are a very common ingredient, and there is usually some degree of spice. It's very easy to make this a vegetarian dish as well, and you can add beans for extra protein. Regardless of the specific recipe, this dish is sure to please. Since moving into our house (almost a year ago! ), the hubby and I have been wanting to host more dinner parties. (Actually, I have been wanting to host more dinner parties, and Jaycob tolerates the idea because it means a good meal and some booze without having to leave the comfort of his own sofa.) 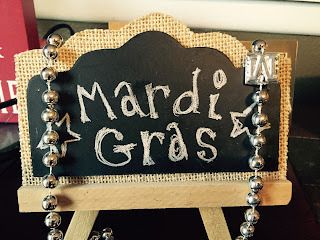 This week we spontaneously hosted a Mardi Gras party. It was a fun night all around, complete with beads, King Cake, a big band jazz Pandora station, cocktails, and good company. I have another Half Marathon under my belt, and a new PR to boot! This past weekend I ran the first annual Phoenix Women's Half Marathon. It was a much smaller event compared to my last few races, with only 182 overall female finishers, and I finished in 57th place. The course was mostly flat, which is usually boring to me, but we ran through a city park and along a small creek, and the view of the mountains to the east was lovely as the sun was rising over the city. Training for a January race was a great way to maintain fitness during the winter and stay motivated to run outside, even on cold and snowy days. I ran in rain, snow, sleet, and wind, not to mention frequent evening runs after sunset. I never once retreated to the treadmill or indoor track. Proper attire was important and I fell in love with the down vest that the hubby bought me for Christmas, which kept my core warm on chilly mornings and has a soft lining and lots of pockets!